It combines spatial database features and application logic within intelligent maps, which leverage GIS to enable radically new customer workflows and deliver map and data-driven applications to anyone, anywhere. It integrates with the OCC (Open Geospatial Consortium) GeoPackage. TerraGo began building interactive geospatial products, and GeoPDF is a self-contained familiar IT platform that appeals to those that work with paper maps. “We wanted to return to that as a central focus of the company,” says Demmy. TerraGo was not focused on data interoperability but still wanted to deliver workflows that more customers could access. “The OGC GeoPackage has promulgated a new standard, and can attach files, photos and other data as a GeoPackage,” says Demmy. The integration of OGC GeoPackage into TerraGo allows for cross-platform interoperability and geospatial intelligence sharing across the entire enterprise and different organizations. 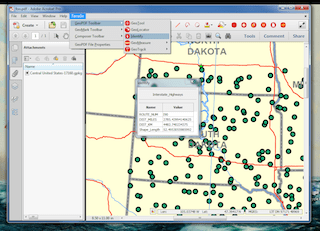 This allows users to share portable containers of geographic information in an open format. As OpenGeoPDF is a technology initiative within TerraGo, it allows a variety of open standards and IT practices to deliver workflows. The OGC GeoPackage recognizes SQL Light, a widely adopted platform used on all cellphones and many browsers. It builds on tops of SQL Light as its existing IT platform, and allows users to take geospatial information and open it in an IT environment. It can be used within the military, governments of all kinds, and other agencies, disseminating information to those who are non-technical users as well as technical users. One of the many benefits of the OpenGeoPDF approach is that GeoPDF maps with embedded feature attributes can be accessed, searched and extracted as an OGC GeoPackage, using any PDF-compatible software. OpenGeoPDF offers limitless, new possibilities for geospatial data interchange and creates much richer applications for end users. These applications leverage potentially hundreds of thousands of features and their attributes by simply using TerraGo Toolbar for Adobe Reader. What's going on at ESRI UC this week? This entry was posted on Tuesday, November 25th, 2014 at 12:45 pm. You can follow any responses to this entry through the RSS 2.0 feed. You can leave a response, or trackback from your own site.